and I find eating my favourite Tropicana Slim's products at home equally rewarding as free wifi. A simple truth, I love being home, and it was shaped a career into graphic design and later, blogging. Nothing is more relaxing on sunday morning than, imagine this: wake up because the smell of Mi Kering Tropicana Slim infiltrate like knocking your door and wake your hungry stomach up. The best thing is knowing the facts that you won't get any fatter or just questioning will I get fat eating this deliciousness of Mi Kering Tropicana Slim in your mind! I found this Mi Kering Tropicana Slim solved my noodle problems, because generally instant noodles contain high amounts of fat and salt, which is unhealthy and bad if you're on diet. I used to refuse eating instant noodles and ended up eating fried rice with the whole garnish which is pretty much the same thing. 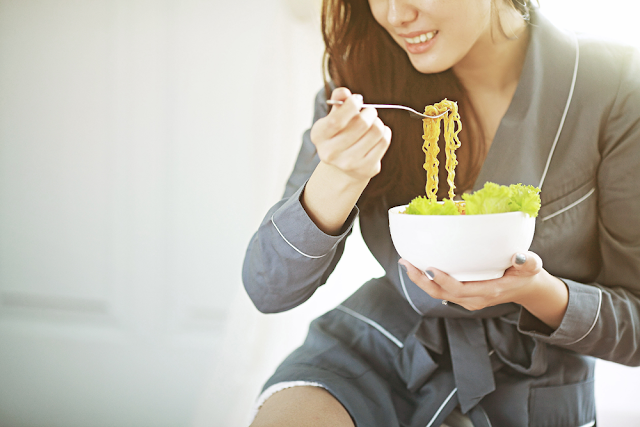 Mi Kering Tropicana Slim comes with low-salt, low fat, and low in calories than the regular instant noodles. With Tropicana Slim it finally pays to say yes to noodle. Letting go doesn't mean losing control. Have a blessed sunday!